Splash Damage once again find themselves in familiar territory. Should Brink be priority one on your objective list? Xbox 360 version tested. Brink should have been the game to realise Splash Damage’s full potential. A coming of age for the modder-turned-pro English studio built on turning id’s Nazi/Alien killing series’ into cooperative team activities. A fusion of team-based FPS, Mirror’s Edge-style free-running and an experience-led leveling system with more in common with Bethesda’s usual portfolio, all wrapped up in a beautifully fractured futurist world. Brink however shows that the developer still has some way to go before stepping out of id’s shadow. Freed from the shackles of id’s concept design, Brink promises a bleak futuristic take on the Noah’s Ark story: A Utopian paradise resort off the coast of San Francisco becomes a reluctant host to the remains of humanity following an apocalyptic flood. The Ark, designed to hold 5,000 people, is now bursting with ten times that number and civil war has broken out between the heavy-handed Security Force and the freedom-fighting Resistance. Brink’s campaign sees you choose chose a side and fight sixteen missions over an eight-day period to either to save the Ark (Security Force) or escape it (Resistance). id Tech 4 is obviously an engine nearing extinction. Brink is not a particularly attractive game with animation in particular years behind current standards. 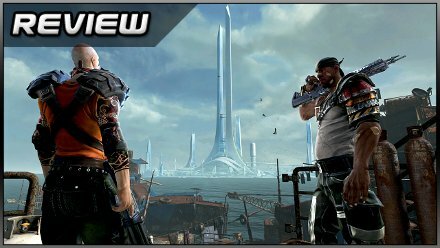 On paper, Brink’s biblical tale involving oppressive tyrants and desperate terrorists offers furtive material for a compelling universe, yet somehow the game completely fails to grip the imagination. Each campaign day gives a short narrative introduction of your objectives consisting primarily of stereotypical grunts (complete with phony Russian/African/Chinese/Irish accents) spouting emotive save-the-world drivel to one another in a way that’s difficult to care about. Of course team-based FPS’ aren’t narrative-driven experiences, but in failing to build a sufficiently compelling universe, Splash Damage are giving you very little to get behind. 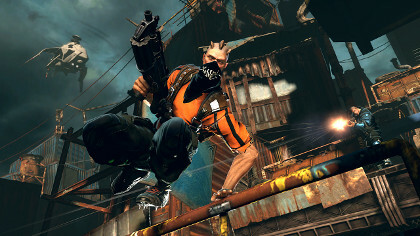 The art direction and character design is serious barrier to connection with Brink’s world. The exaggerated caricatures sit somewhere between Time Splitters and a Scandinavian troll, and as with Free Radical’s distinctly unique take on the human form, your appreciation of them is an entirely subjective matter. Even if I can’t abide it personally, I can appreciate the decision not to follow the crowd. The character design on the other hand is no way near as forgivable. Even though the game’s customisation count stretches to unpronounceable figures, it’s near-impossible to make a character that doesn’t look like a complete and utter prick, sporting seven Mohicans, tribal face tattoos and enough chains to make Camden market jealous. Among the quintillion permutations they somehow managed to forget to include a single female character model too. Re-population on the Ark is going to be tricky. Challenge mode sees you tackling a number of tests for new weapon mods, like reaching increasingly precarious platforms pushing your parkour skills bto the max. 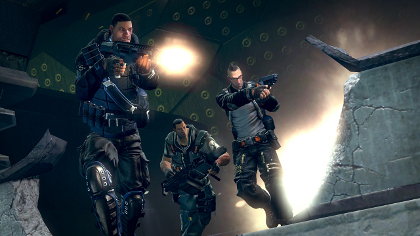 Acknowledging that artistic design isn’t necessarily Splash Damage’s forte, they fare far better in putting together the fundamentals of a solidly playable team-based shooter. Opting for a tight, yet still numerous 8vs8 format, Brink offers four classes – Soldier, Medic, Engineer and Operative. Each posses a handful of unique abilities essential to completing missions, from setting explosives, to defusing them, from healing allies to hacking safes. Teamwork is mandatory and buffing your allies’ health, ammo capacity and damage output is often the difference between winning and losing. Levels are littered with command posts that can be hacked to buff stats and switch between classes, allowing you to adapt to your enemies tactics as and when required. 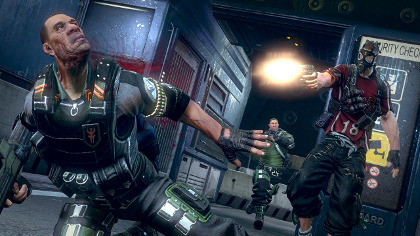 Splash Damage have made much of Brink’s convergence of campaign, co-op and versus modes into one all-inclusive mode that permits any combination of AI, human opponent or lone wolf options. Perhaps unavoidably, this one size doesn’t quite fit all. Single players will be accompanied by a spasmodically unreliable AI team. A team that nine times out of ten will completely ignore any team objectives, forcing you to repeatedly switch between classes to carry out every task single-handedly. The remaining one in ten it will attack the objective with such vigor, it’s finished the task before you even broke the first line of enemy defense. Critiquing what is essentially a multiplayer game for lack of singleplayer satisfaction may seem irrelevant, but if this is where genre newcomers (an audience Brink is supposedly trying to court) are cutting their teeth, it’s worth noting this frustrating aspect is best worth ignoring in favour of real human companions. The Resistance appears to be more concerned with fashion than the plight of the oppressed. I use the term fashion loosely. Objectives themselves are typical fare – hack a terminal here, deliver a sensitive package there, and they generally offer a good balance regardless of the faction you are sided with and the ability to dynamically switch between them offers you a variety of approaches. They are however prone to the odd bout of miscommunication. In an early Resistance mission you’re given the task of “neutralising” a captured Resistance member in possession of sensitive information before he talks. Despite pumping him with enough lead to make him more mineral than man, his health bar would constantly refill and he would rise again to be led off by his Security Force captors. As it turns out, “neutralising” him actually means shooting him into paralysis and then defending him while taking out his captors so they can’t escape with him in tow. It’s the kind of inverted logic that gives videogames a bad name. You really do not want to be on the receiving end of a Resistance “rescue” mission. 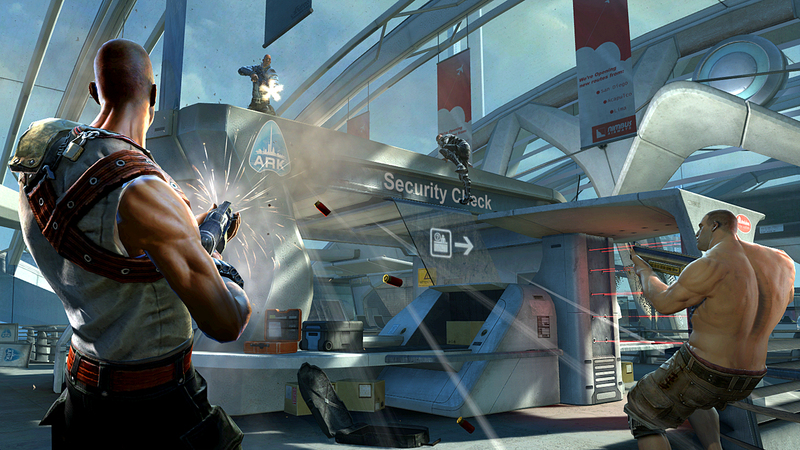 S.M.A.R.T allows you to reach useful vantage points, as well as finding shortcuts. Each and every task you perform gives you experience points, raising ranks and opening access to the new abilities. These can be unique to each of the four classes, such as the Soldier throwing Kevlar’s to his partners or the Medic’s resurrecting Lazarus grenade, as well as universal abilities that span the classes. The ceiling for character maxing is rather low however, which could be seen as a positive if you like variety, or not so good if you’re in it for the long haul. The S.M.A.R.T (Smooth Movement Across Random Terrain) parkour element that separates Brink from its contemporaries isn’t quite as drastic as initial reports suggested. Your access to free running is dependent on your body shape – heavies are extremely limited in their mobility options, middleweights are able to bound obstacles and gaps without issue and lightweights are the speediest of all with gravity-defying wall-runs at their disposal. Environments accommodate your mobility organically, with crates stacked conveniently before high fences and short-cut routes open to leap-happy players. Creative movement (surely the defining principle of parkour) appears to favour the light body-type to a huge extent, and while it successfully manages pre-empt your movements with pleasing accuracy, the automated leaps fail to match Mirror’s Edge’s tactile movements. Meanwhile shooting controls, though editable, are often twitchy (especially on mounted weapons) and lack the kind of visual feedback enjoyed in better examples of the genre. As a new IP in a genre with limited but established console competition, Brink is awkwardly placed between the charm and personality of Team Fortress 2 and the military grit of Quake Wars, failing to carve out a memorable identity for itself. Despite the promise, Brink fails to capitalise on its good ideas and rarely pushes beyond mediocrity. 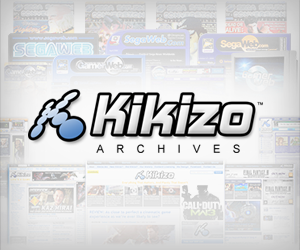 Posted in Reviews, and tagged with Bethesda Softworks, Brink, fps, PlayStation 3, Splash Damage, Xbox 360. Damn, and I was looking for something to fill that Mirror’s Edge-shaped hole in my life.